The American Staffordshire Terrier and American Pit-Bull Terrier both came from a common line starting in the nineteenth century from the breeding of bulldogs and terriers. The two strains split in the early 1900s when dog fighting and other inhumane dog sports were deemed illegal in the United States. While the pit-bull terrier stayed relatively the same, the staffordshire was bred to create a competent show dog breed. 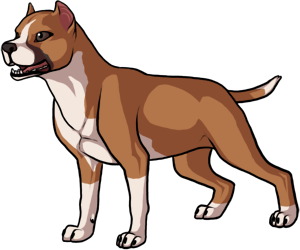 The United Kennel Club considers American Pit-Bull Terriers and American Staffordshire Terriers to be the same breed. They are prone to hives, cataracts, and hip dysplasia. The American Staffordshire Terrier is very good in family life with kids.